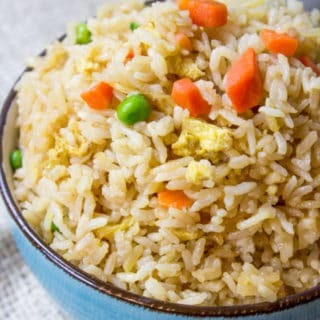 Classic Fried Rice takes just ten minutes to make with day old steamed rice, soy sauce, eggs and oyster sauce. You can add your favorite vegetables and proteins to taste. Add the vegetable oil to a wok or large skillet and add the rice, breaking it apart and mix it into the oil. Cook on high for 3-5 minutes or until rice starts getting a bit cooked through but not browned. Add in the soy sauce, oyster sauce and sesame oil and stir quickly to combine then push the rice off to the side of the pan and add in the eggs stirring them quickly and chopping them as you cook them to break them into little pieces. Add the frozen carrots and peas and mix the mixture together quickly and serve.